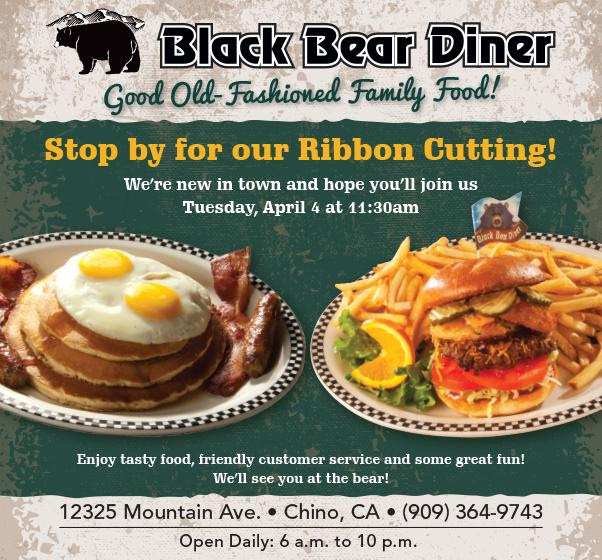 When I checked my email at work this afternoon, I received a pleasant shock: Black Bear Diner is opening in Chino next week! Then I received another shock: It’s not the first Inland Empire location. We’ve been big fans of the diner since visiting a couple of them in Central California several years ago. Turns out the rapidly-growing chain opened a location in Barstow mid-November of last year. That location is in a TravelCenters of America truck stop at 2930 Lenwood Road. The Chino location has taken over a former Carrows at 12325 Mountain Ave., just south of the 60 Freeway. A ribbon-cutting ceremony will be held at 11:30 a.m. April 4. The restaurant will be open 6 a.m. to 10 p.m. daily. This entry was posted in Chino and tagged openings by John Plessel. Bookmark the permalink.